Welcome to my website, where I combine my two favorite subjects: history and writing. I write fiction and non-fiction. The non-fiction works emphasize history either through historic sites or music. That leads to a variety of topics such as music style and instruments, customs, clothing, and food of a specific period. The fiction works often weave the past and present through history, ghosts, within a framework of strong family ties. My newsletter contains articles I’ve written about historic sites ranging from museums, ships, statues, and related topics as well as updates about other writing projects. 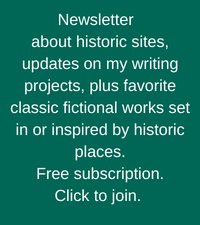 I invite you to subscribe to it if you like historic places and fiction and non-fiction articles. An essay I’ve written about Thomas Jefferson and his interest in music is scheduled to be published in early spring of 2019. I am also working on two novels: excerpts available by clicking on works-in-progress. Throughout this website are two books that are available for purchase: My novel, The Unicorn Tree, published in May 2018, and a collection of stories by various authors, A Lazy Day Anthology, published June 2018. Information, excerpts, and reviews are available by either clicking on the books tab above, or the book covers below to order.